The 2000 Series is composed of a contemporary touchbar made for today’s demanding architectural requirements. Finely machined parts ensure the smooth and easy operation of the touchbar. The clean, streamlined design of the touchbar and case cover are formed around heavy duty rugged components necessary to withstand heavy traffic and abuse. Apex Devices meet the most stringent needs of the owner and architect. Available in Wide Stile and Narrow Stile with a variety of trims. 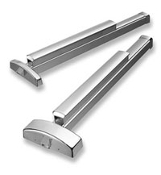 Vandal Resistant Lever trim is available for the Wide Stile Device.